"L. Paul Martel, Westbrook College, Class of 1975"
Westbrook College student L. Paul Martel, Class of 1975, was a Nursing major and a Day Hop. 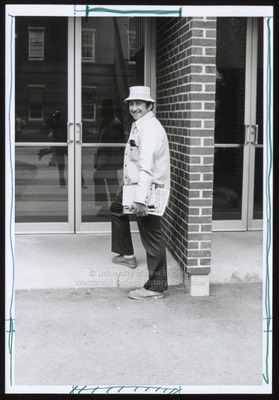 For his senior class candid photo, which appeared in the 1975 Tower Yearbook, he wore a light colored barn jacket and soft hat with dark slacks. Paul poses outside at the entrance to Blewett Hall.